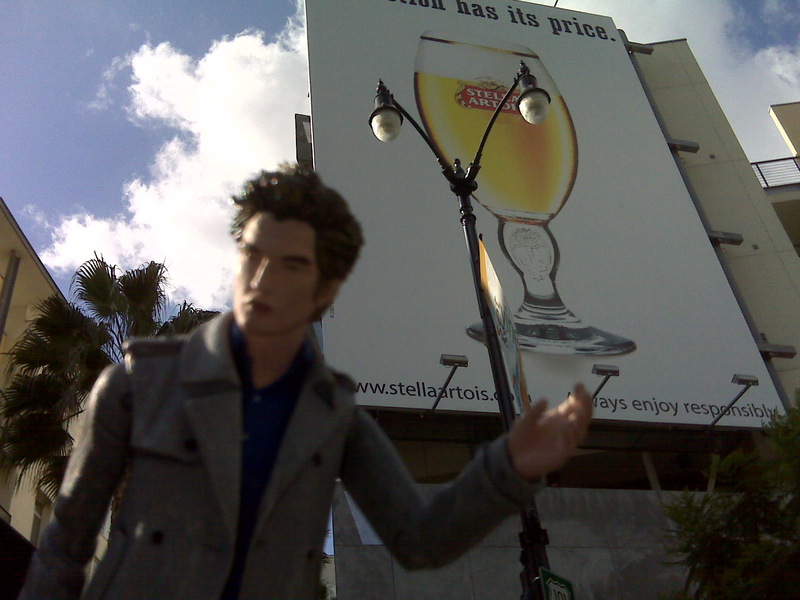 Where in the world is the Edward action figure? He really is breaking all the rules…boldly showing himself in sunlight and holding up giant glasses of alcohol. Mmmm…is that a Stella? One of my faves. He really does have good taste. ciggies are NOT optional… not in my rob-fantasy! @Sass …damn!! He is trying to annoy the Volturi!! We have to save him!! breakin ALL the rules, hanging out of my sunroof, not even caring about dazzling hollywood traffic! @natalie- yup, thats me and edward… we leave a trail of destruction wherever we go! @moon…was he really hanging out of your sunroof? ‘Coz his hair still looks perfect. Not surprising though, must be the mousse! And yes, I know smoking is bad for you, but frig, just once!!! Here is an important question. How come the paparazzi over in England are not hounding Robert Patterson? Since he is a high commodity in both nations how come we don’t see pictures of him around there in London? You know, just because the paparazzi over there is suppose to be more aggressive. He must have a high price tag over his head for those photographers to get pics of him. Now if he was in LA we know we would be getting more material! LOL! he’s so mean looking, that edward action figure. So, when do we see this dude on perez in said pub? that edward action figure…he’s so mean looking! i think he was bashed up as a kid when he was a model for homosexual scarves. @Laura could you not use your own imagination to create a Laura doll, I’m sure if one set her mind to it, with alittle time, fabric and clear silacone it would be totally possibe to bulild a Nat….I mean Laura doll. January 23: Today we heard from Taylor Lautner’s representative that he is unfortunately unable to appear at any conventions during this timeframe due to prep work on the new film. OK, so he will not attend to that convention thing because he has to go to the GYM?! :S He’s kinda weird. @NC hilarious! well, you saw his daily schedule (you made it) it’s PACKED ! no time for any fan-love! @ Sass – It’s not so much mousse keeping that hair perfect as the grease that has built up over 2 weeks of not washing it. Our Rob is a VERY dirty boy! While at the mall this weekend with the fam, I purposefully bee-lined it to Hot Topic to buy an Edward doll. My husband wouldn’t let me buy it. He NEVER says no to me about stuff but he totally put his foot down. WTF?! He said he didn’t want to spend $16 on a plastic figure that has no resemblance to the actual character. I was appalled. I mean I agreed with him that it doesn’t look totally like him, but I still wanted it. Just to have it … just to have a piece of Rob. I’m crying. Crying rivers. @NC & UC Taylor is taking this “prep time” pretty seriously. You know it prob is gym time b/c they sure as hell don’ need a lot of time to slap that ridiculous wig on his head! @Wendy – Do what I do…order everything online. By the time it arrives at the door, its too late for the hubby to do anything. I mean, sure he can return it, but my hubby is far too lazy to go through that much effort. Gah!! I want posters and dolls and t-shirts and giant cardboard cut-outs and Cullen crest wrist cuffs and stickers to plaster all over my notebook…why, oh why do I have to be a 16 year old fangirl trapped in a 46 year old body????? @Natasha…at least once you hit a “certain age”. @Wendy – He actually agreed to the poster?!? Wow, my hubby thinks I’m being sooo ridiculous and agrees to nothing. In fact, he’s been giving me so much grief over rereading the Twilight series, participating in these blogs, looking at pics, videos, anything Rob related. @uc – Great idea! I’m going to Tulsa this weekend for work…maybe I can find the time to hit the local Hot Topic sans Mr. Amber! @Amber…lmao over your gassy hubby!! And I saw the Edward cut-out at a video store at the mall the other day…I am sooooo close to saying screw it and buying it and just living with the ribbing I would get from my dh (who is also a gassy boy) and my kids, lol. @UC…I bet Edward would come in handy at the poker table…after all, a good ming reader is hard to find, hee! @Amber – I know, I don’t know his logic, but I’m thinking a little Edward figure that I can put in my purse would be LESS obsessive than a poster in our bedroom! Or perhaps more obsessive since I’ll be traveling around with a plastic Edward and taking him out to pet him and love him? Hmmm. I made an Edward keychain for myself and my friend and the hubby just thinks that’s HILARIOUS. As in, eye roll, hilllarrriiiass. @sass – I saw all of that stuff at Hot Topic and I wanted to get it! If my kids were older (they are four) I’d be buying that stuff for “them”. @Wendy…my daughter is almost 8, still a bit young for that too…although she does have a black cat Webkinz, with golden amber eyes and she named him Edward, so perhaps I could force, er, coax her into it! Quickly! The more people we surround ourselves with, the less crazy we look to the rest of the world! @sass – are there size 4T Twilight shirts out there? I need to find out. @Wendy – Nice!! I thought since she was rolling her eyes at you that she may not understand, but clearly she gets it. She should totally join us! Also, I’m almost betting you could go on CafePress.com and found Twilight clothing for toddlers. @Wendy – I reread your post, and now I get it! I just read it wrong the first time. Must have had Rob on the brain. I want to get those for my daughters. Don’t you think they’d look cool wearing them to preschool? All the Edward Wallpaper your heart desires! @Vicky – what a find! Yikes those are GREAT images! @ Wendy – Your daughters would be the coolest kids in school with those shirts. I should buy one for my little girl, she’s 19 months. She could pull it off! @Amber – our kids NEED those shirts. I’d rather they had a shirt with Rob’s head on it, I’ll have to keep searching. How’s this for funny: my daughter found a pair of plastic vampire fangs in the toy chest and put them on and came up to me to “kiss” me – she said, “You love vampires mommy!” hahahahahahahaaaaaaa! I guess I’m not exactly being subtle with the whole Twilight love. @Wendy Yes it is amazing what you can find on the internet by accident when you are avoiding writing a 3000 word paper. Now, If I had to write a paper on Twilight or Rpattz it wouldn’t be a problem! OMG, some of those shirts are adorable…methinks I will be ordering something for my daughter! And those banners are to die for as well! @ Karen – That is soooo adorable!! I looked for Rob on a shirt for kids, but haven’t found yet. If I see it, I’ll post it for you! and yes…i LOVE my Edward keychain!!!!! @lauren- he’s breaking ALL the rules! you should have seen him driving my car in traffic! @everyone- YES buy your edward dolls and send us pics!!! we need to get him outta LA! @sid & UC, yeah you can’t even get a Twi calender here, it’s THAT bad! We live about an 17 hour drive away from where they’ll be filming- close- unfortunately no. ROB- COME TO EDMONTON!